1 custom made box protector for many Funko HQ Smaller Freddys! Please check your size to make sure it will fit in these dimensions. There are Freddys that don't fit! The larger ones like CHROME, DIY, ROBIN, RETRO BATMAN etc are too large but we have a different size for those! These are 6.125 x 3.875 x 3.875 or roughly 15.5 x 9.9 x 9.9cm. 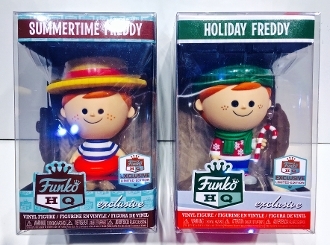 These fit the following and there could be others: Summertime, Holiday, Rain City, Halloween and possiby Freddy Bot but check your size on that one. Let me know if you know of any others that are the same size please!